Young Australians unable to afford to buy a home? Interest rates at 1,5%, the lowest ever? Salvation lies in consistent positive Terms of Trade. What is the proper message we should hear from Australian Government Treasurers? Below is a potted summary of the Australian financial situation from mid-2014 to mid-2016. It will be shown that the above adjectives tend to disguise the situation. This is a call aux armes citoyens to drive up our Terms of Trade and to ensure we are not bamboozled by misleading commentaries from our ruling elite. The catalyst for this offering is Treasurer Morrison’s embrace of Australia’s mid-2016 accounts. To place his enthusiasm into context, we start with Treasurer Hockey in mid-2014. Forward again to September 2016. Treasurer Morrison has commented with gusto on the National Accounts for the June quarter. We are told there is no sign of a downturn in the economy which has grown by 3.3% – the best growth since 2012. There was also fulsome comment that the growth rate is a tribute to hard working Australians. 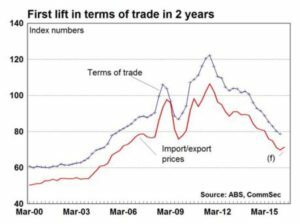 No where, apparently, was there reference to a need to encourage exports and thus improve the Terms of Trade. 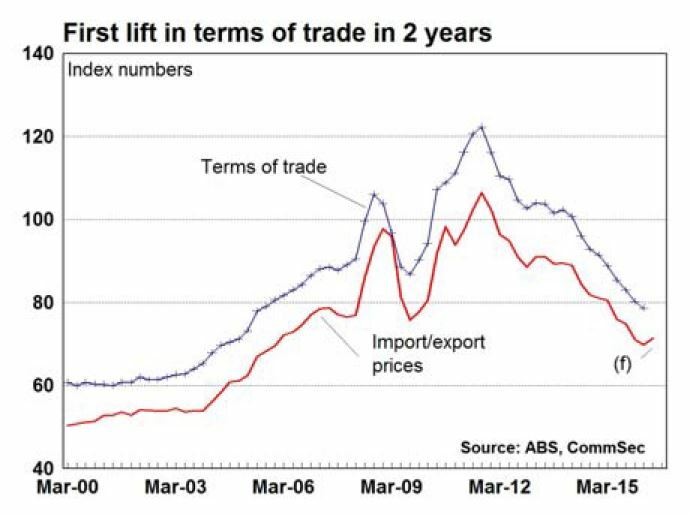 Mr Morrison noted that the Terms of Trade for July showed a $285 m reduction on the June figure (ABS 5368.0) due to slightly increased exports and decreased imports which might indicate less disposable income was available for overseas goods. What was not made clear by the Treasurer was that the 3.3% GDP growth was boosted by pre-election Government spending and, curiously, on increased expenditure on hepatitis C drugs. (SMH, 7 September 2016) Currently brakes on the economy are weak household spending, weak wages growth and a decline in the national hours worked. Irrespective of encouraging statements by the Treasurer, the historic low interest rate, now 1.5%, and low inflation rate of 1.0% (RBA band 2 – 3 %) is indicative of a sluggish economy. The tentative conclusion, is that statements by recent Australian Treasurers cannot be accepted at face value. Their statements must be evaluated within the wider picture of the Australian financial situation. The driver for the future is a positive Terms of Trade that, initially, balances the budget from this jobs and growth and other benefits will follow.